This post was done in partnership with Pure Leaf, who sponsored this recipe by providing the tea in this recipe and the compensation to make this post happen. As always, all thoughts and opinions are my own, and thank you for supporting Hummingbird High and my awesome sponsors! It rains a lot in Portland. This is a fact that I've always been aware of, ever since I first moved here in 2005 for college and bought my first real rain jacket (a very utilitarian black and grey jacket from The North Face that I still own). It's a fact that I've always been acutely aware of when people come visit for the summer, when the city is sunny, glorious, and bursting in blooms, and tell me they want to move here. But then they find out that the statistics: an average of 300+ days of rain a year, with usually only 60 fully clear days. Never mind. I don't mind the rain. It keeps Portland under the radar, and allows us to have our own special kind of fun. With short days, grey afternoons, and the kind of soggy cold that comes from the rainfall, you learn to make do. Winter in Portland is all about the rain, and for me, it's all about getting hygge with it. I'm sure by this point you've heard the Danish word "hygge". Although I like to say "higgy" in my head, it's actually pronounced "hoo-guh". I like to think of it as the Danish coping mechanism to dealing with their winters, which is harsher and wetter than ones in Portland. The word has no direct translation in English, though "cozy" comes close. But it's so much more than that. It also means appreciating the good and satisfaction in the everyday. Wool socks, a warm cup of coffee, a roaring fire place — these are all considered to be hygge, or, if we're being technical, hyggelig (hygge's adjective form). The tea is Pure Leaf's Home Brewed hot Black Tea with Vanilla: so fragrant, floral, and flavorful. My favorite of their entire collection. 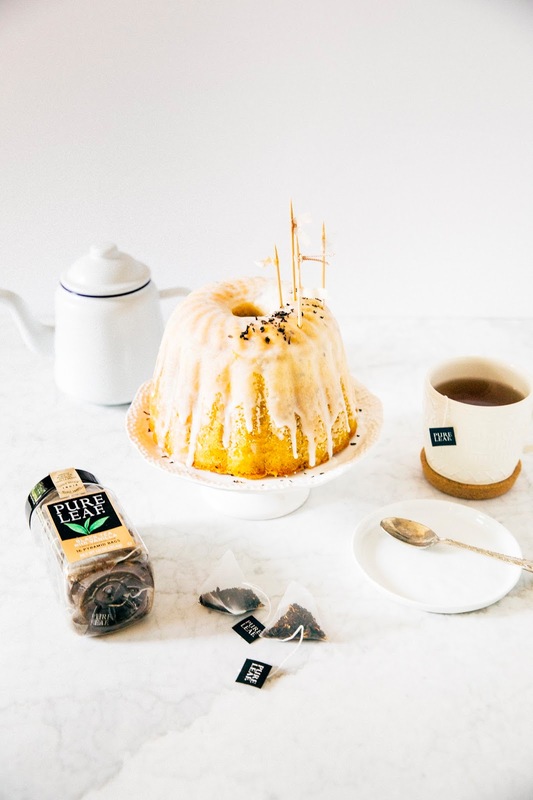 I've baked it into my favorite lemon bundt cake for an extra hygge lemon, black tea, and vanilla flavor. Enjoy! 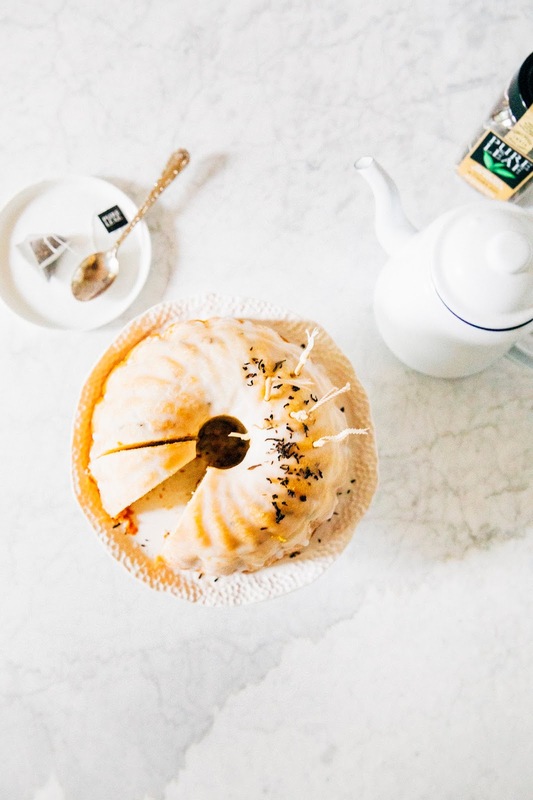 I baked this cake in a 2-liter pudding mold that holds around 4 cups of batter, creating a European-style smaller-than-average-but-not-quite-small-enough-to-be-called-mini bundt cake. In a pinch, you can divide the batter between two 8-inch pans and make a layer cake instead. Don't try and make the cake in a regular bundt pan; this recipe does not make enough batter to do so. 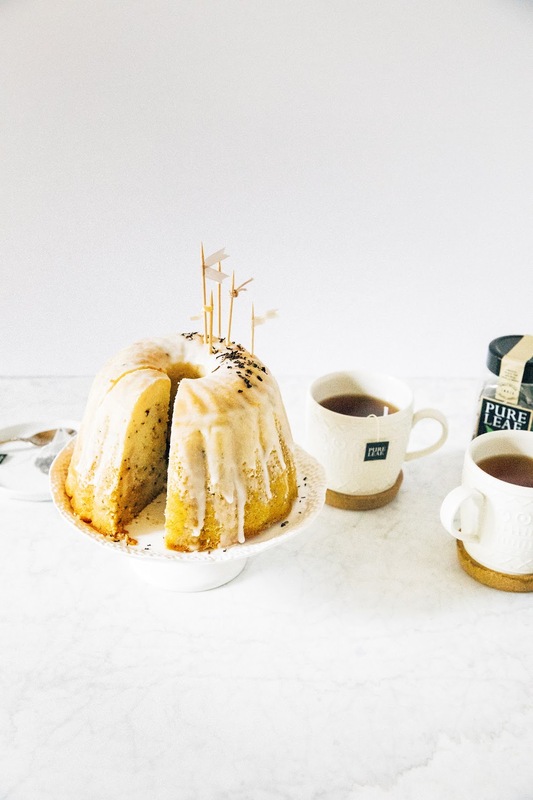 Because my bundt cake was so tall, I had a hard time getting the tea syrup to soak all the way through the cake. Instead, it only soaked halfway through, creating an ombre effect in the slices. I was into it, I thought it gave the cake a really cool, marbled look! But don't be surprised if you've baked your cakes in traditional cake pans and the color is different; because those cakes will turn out thinner, your syrup will soak all the way through, creating a uniform, darker cake that both Paul Hollywood and Mary Berry will instantly approve of. Center a rack in the oven and preheat to 350 (F). Prepare your cake pan by spraying generously with cooking spray. 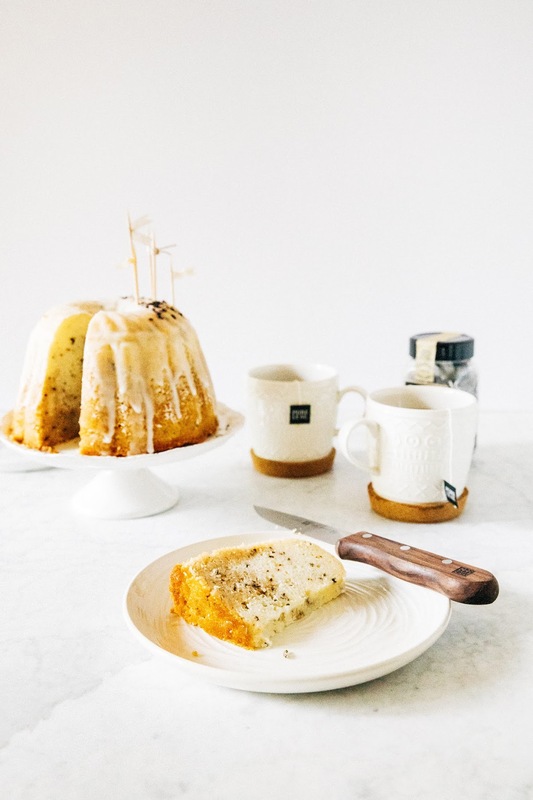 Seriously, if you're using a bundt mold, use a LOT. Don't forget to spray the metal dent in the middle of the mold. Set aside. 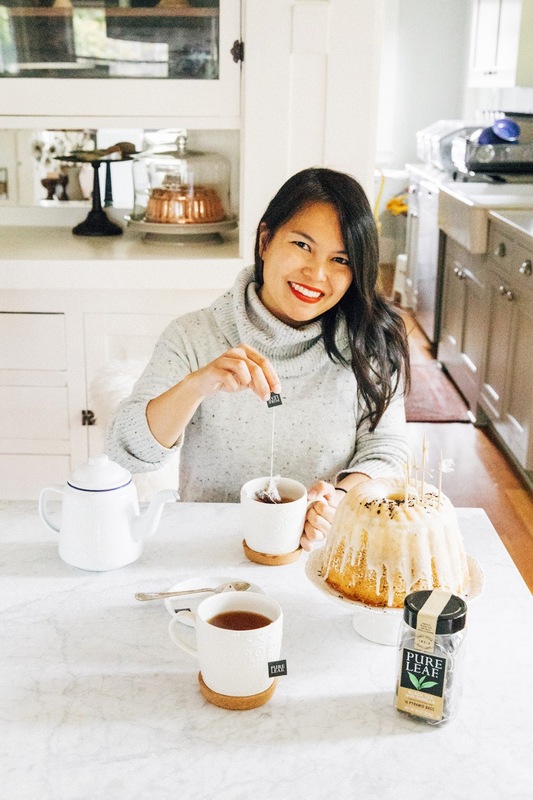 In the bowl of a food processor, combine 1 1/2 cups granulated sugar, the tea from 3 Pure Leaf Black Tea with Vanilla satchels, and fresh zest from 2 medium lemons. Pulse in short bursts for around 30 seconds, or until the lemon zest and tea has been ground into smaller pieces and is fully incorporated throughout the sugar. Don't be worried if your sugar clumps — this is normal and is just the zest releasing oil into the sugar to make it more flavorful. In a medium bowl, whisk together 3 1/2 cups cake flour, 3 teaspoons baking powder, and 1/2 teaspoon kosher salt until well combined. Set aside. In the bowl of a freestanding electric mixer fitted with a paddle attachment, combine the processed sugar (from the 2nd step) with 1 cup unsalted butter. Beat on medium speed until light and fluffy, at least 3 to 5 minutes. When the mixture is light and fluffy, lower the mixer speed to its lowest setting. Add 8 large egg whites, one egg white at a time, only adding the next egg white when the previous one has been incorporated. When all the egg whites have been incorporated, add 1 teaspoon pure vanilla extract. Continue mixing the batter on low speed. Add the dry ingredients (from the 3rd step) in three parts, alternating 1 cup whole milk in 2 parts, starting and ending with the dry ingredients. Continue mixing until just combined. Transfer to the prepared cake pan and bake in the preheated oven for 1 hour, or until the bottom of the cake is golden and springs back when gently touched. When the cake is ready, transfer to a wire rack and allow to cool in the pan. While the cake is cooling in the pan, make the lemon and black tea syrup. In a small, heavy-bottomed saucepan over medium heat, combine 1/2 cup granulated sugar and 1/2 cup Pure Leaf Black Tea with Vanilla. Whisk until the sugar dissolves and bring the mixture to a boil. Boil for one minute, then transfer immediately to a liquid measuring cup and allow to cool slightly on a wire rack for 5 minutes. After the syrup has cooled slightly, use a wooden skewer or a fork to poke a bunch of holes onto the top of the still-inverted cake (so, technically, you would be poking holes on the bottom of the cake if it had been inverted out of its pan). Use a pastry brush to spread the warm syrup across the bottom of the cake, stroking the syrup around to encourage it to leak into the holes. Don't be shy — use up all the syrup here to get an incredibly moist and delicious cake! Once you've completed "soaking" the cake with the lemon syrup, invert the cake onto its serving platter and allow to cool completely before glazing. 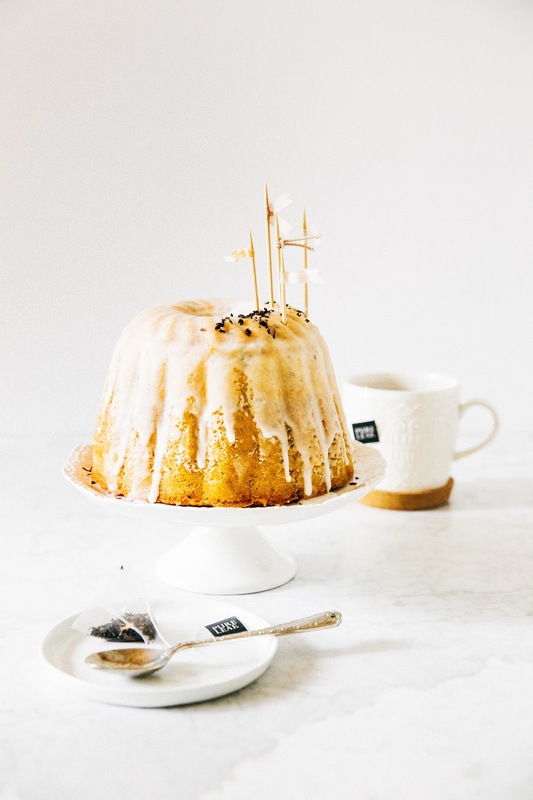 Combine 1 cup confectioner's sugar with 2 tablespoons Pure Leaf Black Tea with Vanilla and whisk until a thick glaze forms. Once the mixture is a thick, almost syrupy texture, pour over the cake immediately.